Medium-sized to large, stout-bodied insects; head large, and usually hypognathous, with chewing mouthparts; compound eyes large; pronotum large and saddle-like; usually two pairs of wings, the forewings typically thickened (leathery) and called tegmina; either or both pairs of wings may be reduced (= brachypterous) or absent (= apterous); tarsi usually 3- or 4-segmented; hindlegs usually much enlarged and adapted for jumping; cerci 1-segmented. 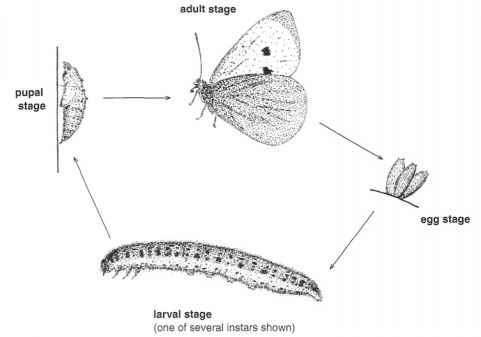 Metamorphosis incomplete; development includes egg and nymphal stages. Antennae many-segmented, often longer than body; tarsi 3- or 4-segmented; ovipositor, if present, usually elongate. Relatively broad-bodied, with a tympanal organ located on each front femur; antennae longer than body; forewings relatively short and held mainly horizontally when in repose. EXAMPLE: Acheta domesticus (house cricket). Tarsi 4-segmented; wings often reduced; cerci short, those of males curved upwards; ovipositor broad and robust (Fig. 17); males stridulate by rubbing the forewings together; tympanal organs, when present, located on the fore tibiae. Mainly tropical and of little or no economic importance in northern Europe. Tarsi 3-segmented; ovipositor usually needlelike; cerci long; males stridulate by rubbing the forewings together. Robust-bodied, with forelegs greatly enlarged and modified for digging (Fig. 16); antennae shorter than body; eyes reduced; ovipositor vestigial. EXAMPLE: Gryllotalpa gryllotalpa (mole cricket). Fig. 16 Foreleg of a mole cricket - family Gryllotalpidae. EXAMPLE: Leptophyes punctatissima (spotted bush-cricket). Antennae shorter than body and with fewer than 30 segments; ovipositor, if present, short and robust. The largest family, encompassing locusts and short-horned grasshoppers; antennae short and stout; pronotum with a median ridge; tympanal organs located in the sides of the abdomen; individuals stridulate by rubbing the hindlegs against the forewings. Although of significance as crop pests in many warmer parts of the world (the devastation caused by locusts being legendary), no species are of economic importance in northern Europe. Tarsi usually 3-segmented; ovipositor present.